For its centenary celebrations in 1921, the newspaper marked the occasion by creating a photograph album showing all the staff on its paper. Several copies were made, which are now held by the Guardian News & Media Archive (GNM Archive) and the Manchester Guardian Archive, at the University of Manchester's John Rylands Library. The GNM Archive also hold the glass plate negatives for some of the photographs which appear in the albums. The photographer is believed to be Walter Doughty, the paper's first staff photographer from 1908 to 1942. The albums give insight into what working for a newspaper was like at the time. The scenes depicted are a stark contrast to the newspaper industry and general working world of today. The sexual division of labour is clear, with few women working on the newspapers itself but in jobs such as canteen cooks or as cleaners. Many of the jobs such as the department that looked after the horses and carts, which were used to deliver the newspapers, are now redundant. 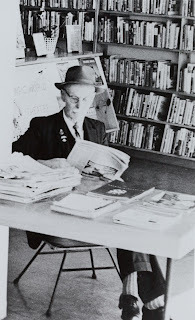 Auckland Libraries provides access to the Guardian newspaper from the very first issue onwards through the ProQuest historical newspapers database. Find out more and search the database (you can access this database in the library or at home - external access requires a library card barcode and pin). And don't forget, for other research using newspapers, the heritage research centres around the region hold a vast array of local, national and international titles. Some of the Auckland titles have been digitised and are accessible and key word searchable through Papers Past.